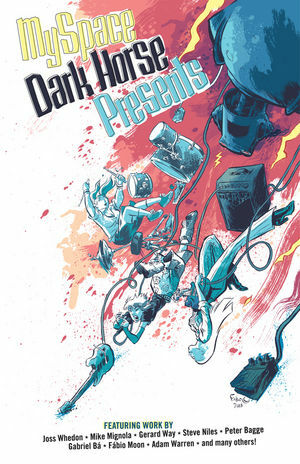 The first six issues of MySpace Dark Horse Presents includes Joss Whedon's complete rock'n'roll saga Sugarshock!, a fun-filled story about a quirky girl named Dandelion, and her love of music (and hatred of Vikings); Mike Mignola's haunting holiday tale, lushly illustrated by Guy Davis, "The Christmas Spirit"; a lost Umbrella Academy chapter written by Gerard Way about our favorite curmudgeon, The Kraken; and a four-part story dedicated to Eric Powell's The Goon. This volume also includes a wide range of established comics talent, and stories from newcomers who saw their professional debut in MySpace Dark Horse Presents. Features Joss Whedon's comics creation Sugarshock!